Two U.S. defense officials told NBC News on Friday that Key Resolve and Foal Eagle, the two annual large-scale joint military exercises with South Korea, will no longer be held. President Donald Trump has complained about the high cost of the exercises and reportedly believes ending them will reduce tensions with North Korea. 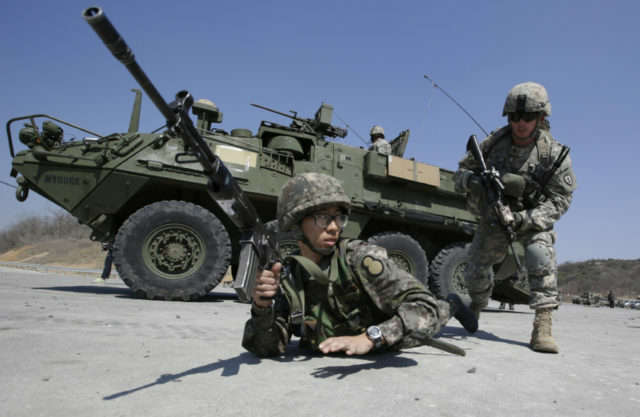 According to NBC’s sources, the new approach to training with South Korean forces will involve smaller and more specific exercises. The defense officials said the larger exercises were valuable as a demonstration of strength and deterrent to North Korea, and if the new policy for the peninsula does not involve sending such messages, training objectives can be more effectively met with a larger number of smaller exercises. This assessment was challenged by former CIA officer Bruce Klingner, now a senior fellow at the Heritage Foundation, who said the military has long insisted large-scale exercises had significant training value. “If you continue curtailing your exercises, on what day has it reached catastrophic proportions? It’s hard to measure. But you know, over time, there has to be a degradation,” Klinger worried. Large-scale exercises have already been suspended to facilitate diplomacy with North Korea, which has long complained about the training missions, portraying them as dress rehearsals for invasion or even cover for launching an actual invasion across the DMZ. A total of four high-profile exercises were suspended in 2018, including both ground and aerial training operations. Friday’s rumor of a formal announcement follows Acting Defense Secretary Pat Shanahan stating on Thursday that current U.S. troop levels in South Korea are “ideally suited for their current mission.” Shanahan endorsed small-scale training exercises and said suspending the larger operations would not affect troop readiness. The topic was raised because President Trump said during his trip to Vietnam that he was rethinking the cost and utility of large exercises on the Korean peninsula. “I was telling the generals, I said: ‘Look, you know, exercising is fun and it’s nice and they play the war games,’” Trump said from Hanoi. “I’m not saying it’s not necessary, because at some levels it is, but at other levels, it’s not. But it’s a very, very expensive thing. And you know, we do have to think about that too,” he said. NBC’s sources did not indicate when a formal announcement of the revised U.S.-South Korean training strategy would be made.